Product code: R182 Categories: Sold Items, Sold Rings. For centuries people have been heat treating sapphires and rubies to improve the colour and clarity and this is accepted as a completely normal and standard practice and is not meaning that a treated sapphire is synthetic. However to find an untreated sapphire is wonderful, and to find one of this colour and size just makes it even more special. 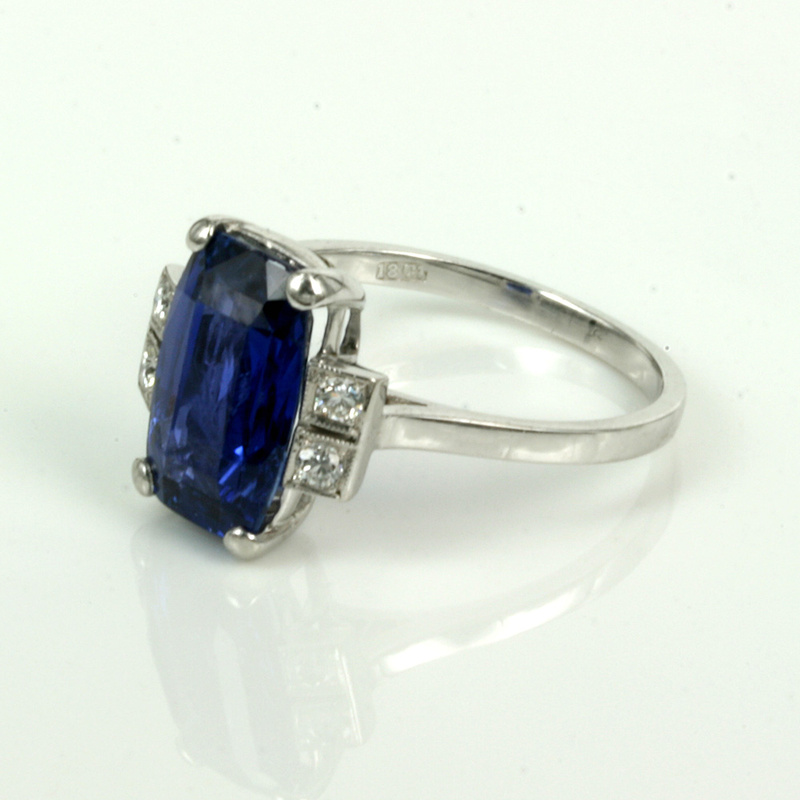 The ring itself dates from the 1930’s and was made to show off the spectacular colour of this natural untreated sapphire. Hand made in platinum, the white colour really matches so well with the royal blue of the sapphire and the two diamonds set on each side. This ring is all about the sapphire which is a Ceylonese sapphire that has not undergone any treatment other than being facetted. Measuring an impressive 6 carats in weight, this colour of sapphire is absolutely stunning and looks incredible in the natural sunlight. To find an untreated sapphire is rare, to find one that is 6 carats in weight and of this colour is rarer still making this ring truly spectacular. On each side are the two diamonds, with the four diamonds having a total weight of 0.12 carats and across from one side to the other, this distance measures 14mm across by 13.4mm in length for the sapphire. This is one of the finest Art Deco sapphire and diamond rings around, and with an untreated sapphire, this just makes it all the more special and unique.